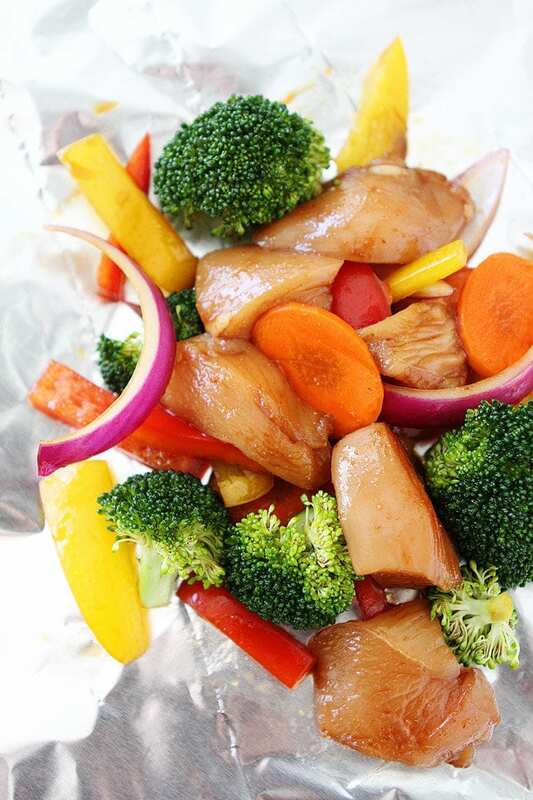 Asian Chicken and Vegetable Foil Packets are easy to prepare and cook on the grill in no time! Tin foil dinners are always a good idea during the hot summer months. They are easy to prepare and cook on the grill in no time. 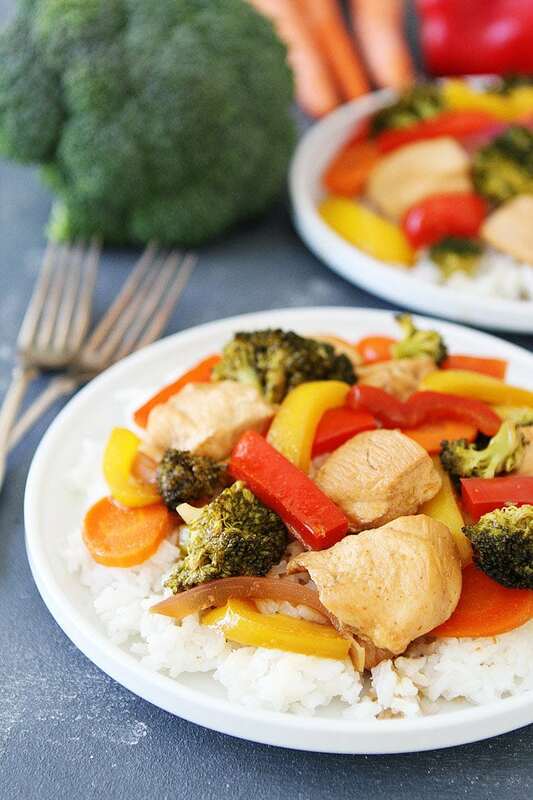 These Asian Chicken and Vegetable Foil Packets are a family favorite. The packets are made on the grill and taste just like stir fry. The best part? You don’t have to stand over the hot stove to make dinner, the grill does all of the work! 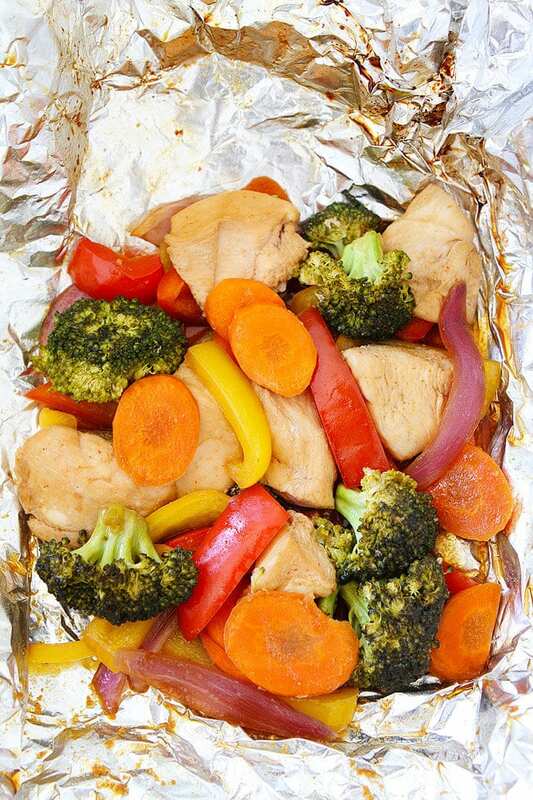 We fill aluminum foil packets with chicken, vegetables, and a simple Asian sauce. We like to use broccoli, bell peppers, carrots, and red onion, but feel free to use your favorite vegetables. This is a great clean out the fridge meal, if you have mushrooms, cauliflower, zucchini, or asparagus, throw them in! All vegetables are welcome. The grill cooks the chicken and vegetables in about 20 minutes and the clean up is a breeze! Throw away the foil and enjoy a delicious and healthy dinner. We like to serve the chicken and vegetables with rice or quinoa. It tastes just like stir fry, but without the frying, which is so nice during the hot summer months. We are all about grilling outside when it is hot outside! 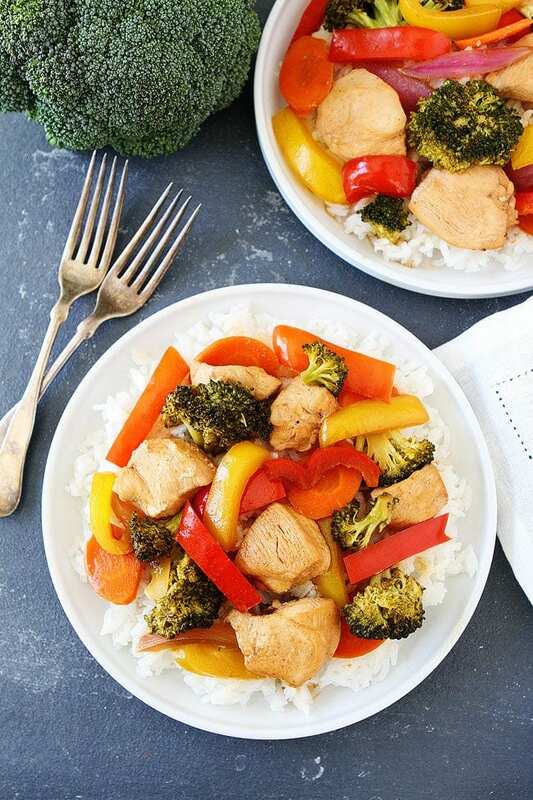 Make Asian Chicken and Vegetable Foil Packets for dinner this week! 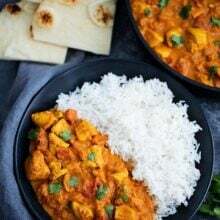 You will love this quick and easy meal! Enjoy! 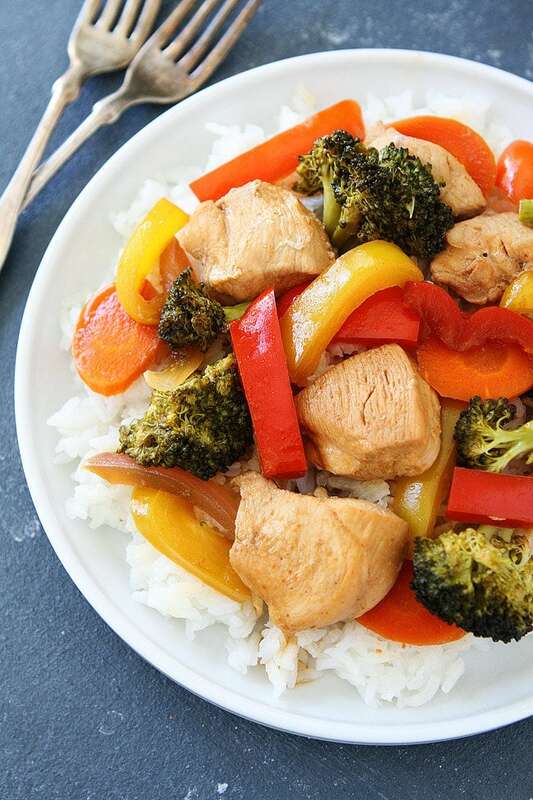 If you like stir fry, you will love these easy Asian Chicken and Vegetable Foil Packets. We like to serve them with rice or quinoa. Preheat grill to medium heat. 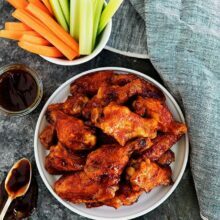 In a small bowl, whisk together the soy sauce, rice wine vinegar, olive oil, brown sugar, sesame oil, cornstarch, garlic powder, ground ginger, and Sriracha sauce. Place the cut up chicken in a large Ziploc bag or bowl. Pour half of the sauce over the chicken and let it marinate for while you cut the veggies and make the foil packets. To make the foil packets, cut 8 sheets of heavy duty aluminum foil, about 12×18 inches each. Place two sheets on top of each other, so you will have four foil packets. Set aside. Place the cut up vegetables in a bowl and pour the remaining sauce over the vegetables. Stir until vegetables are well coated. Place the chicken in the center of the four foil packets, distributing it evenly. Discard the leftover marinade. Evenly distribute the vegetables onto the four foil packets with the chicken. You can spoon the extra sauce over the top of the chicken and vegetables. Bringing the short sides of the foil together, fold the seams together twice and then tuck the ends in and up to seal tightly. Place the packets on hot grill. 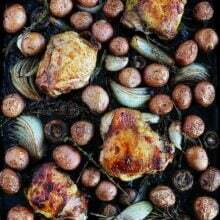 Close the grill and cook for 17-20 minutes or until chicken is cooked through and vegetables are tender. Carefully remove the packets from the grill and serve warm. Note-you can let the chicken marinate in the sauce, in the fridge, for up to 8 hours. We like to serve the chicken and vegetables with rice. We make the packets on the grill, but you can also bake them in the oven at 350 degrees F. These packets would also work over a campfire. We’ve been making something really similar for dinner the last few nights and I love it! So quick and easy, and delicious! Love this idea so much!!! My family loves chicken stir fry and I love not having to cook this on the stove…. win win!!! Love the idea! So simple and yummy! So simple and SO delicious! This is the perfect weeknight dinner fix. Yum! 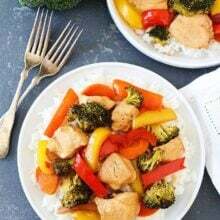 Stir-fry is on repeat at our house but I love the simplicity of this foil packet version! And it looks SO good! I love how easy and healthy this dinner is and NO cooking MESS!!! pretty sure you are a mind reader! I was thinking i need to make an Asian Pork Foil packet dinner. So gonna try your chicken version instead! I love foil packs, always juicy, less mess and the kids feel like they’re getting a present lol 🙂 Awesome!! I love cooking in foil packets. Anything that leads to less dishes is a win in my book! 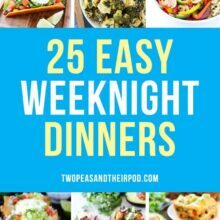 This looks like the perfect easy dinner! Foil packs for the win! Loving this Asian twist. This sounds good! Would love to experiment with different sauces too. Lots of options! Looks yummy. How do you think the timing might change if made in an oven? Would a grill pan on the stove be an option? The oven will work! I would do 350 degrees for 20 minutes and check it, it might need more time, but just to be safe:) Enjoy! Nice idea Maria. Nice packaging idea. Thanks! The clean up is a breeze! Great recipe and perfect for a weeknight dinner! Thanks for sharing!